Spinal accessory nerve (SAN) palsy is an uncommon pure motor mononeuropathy. Fibers of the spinal branch of the SAN innervate the sternocleidomastoid and trapezius muscles. We present a case with SAN palsy. A 34-year-old man presented with the complaint of asymmetry of the shoulders since 9 months. He denied any neck or shoulder pain and could not recall a specific precipitating traumatic event. On neurologic examination, he had an asymmetric neckline and drooping of left shoulder. He was able to abduct his arms beyond the horizontal position and actively complete a full range of motion. He had mild weakness of the left trapezius muscle with no wasting or weakness of the ipsilateral sternocleidomastoid muscle. 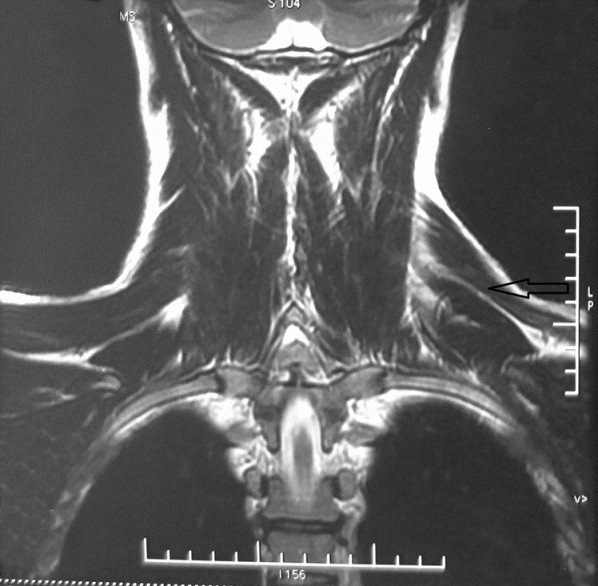 Magnetic resonance imaging (MRI) revealed atrophy of the left trapezius muscle [Figure 1]. Nerve conduction study (NCS) of the left spinal accessory nerve, with surface stimulation along the posterior border of the sternocleidomastoid muscle and recording from the trapezius, recorded compound muscle action potential with lower amplitude compared to the right side (4.2 mV vs. 6.6 mV). Rest of the NCS was normal. Needle examination of left upper trapezius muscle showed intense positive sharp waves and fibrillation potentials and moderatly reduced recruitment of motor unit potentials, with prolonged duration and slightly increased amplituded. Rest of the needle examination was normal. These findings were consistent with SAN palsy distal to the innervation site of the sternocleidomastoid muscle. Consequently, a diagnosis of chronic left idiopathic SAN palsy was considered and he was prescribed progressive strengthening exercise of the trapezius. The most common cause of SAN palsy is iatrogenic damage during neck surgery. The superficial location of the SAN in the posterior cervical triangle makes it very susceptible to injury. Some sports activities and deep tissue massage may be responsible for spinal accessory nerve palsy in exceptional cases. The diagnostic evaluation of SAN palsy should be based on history and physical findings and should be confirmed by NCS and electromyogarphy. SAN palsy may lead to dysfunction of the trapezius muscle, which results in drooping of the shoulder, asymmetry of the neckline, downward rotation and protraction of the scapula, and weakness of forward elevation and abduction movements, but there are many partial forms that are well-tolerated. Although MRI reveals muscle abnormalities in more than 50% of cases, the most helpful diagnostic tests in confirming SAN palsy are nerve conduction studies and electromyography. The role of EMG in predicting prognosis is limited. Good outcomes were reported in some cases of SAN palsy, even though dense fibrillation potentials were observed 9.5 months after onset. In conclusion, spontaneous SAN palsy of unknown origin is a very rare neuropathy. Clinical, electrophysiological, and MRI examinations should be done appropriately for the accurate diagnosis of SAN palsy in patients with an asymmetric neckline. 1. Kelley MJ, Kane TE, Leggýn BG. Spinal accessory nerve palsy: Associated signs and symptoms. J Orthop Sports Phys Ther 2008;38:78-86. 2. Berry H, MacDonald EA, Mrazek AC. Accessory nerve palsy: A review of 23 cases. Can J Neurol Sci 1991;18:337-41. 3. Kim S, Choi JY, Huh YM, Song HT, Lee SA, Kim SM, et al. Role of magnetic resonance imaging in entrapment and compressive neuropathy-what, where, and how to see the peripheral nerves on the musculoskeletal magnetic resonance image. Part 2. Upper extremity. Eur Radiol 2007;17:509-22. 4. Frýedenberg SM, Zimprich T, Harper CM. The natural history of long thoracic and spinal accessory neuropathies. Muscle Nerve 2002;25:535-9.